How to image your samples during compression and tensile tests, using X-ray micro-CT and specially designed material testing stages. 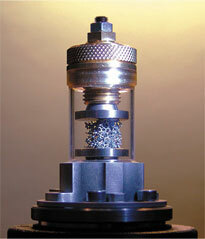 Study changes in your sample’s micro-structure when pressure is applied, using mechanical testing stages. With 3D internal imaging, you can observe the results in-situ, inside your micro-CT scanner. During scanning, the sample is subjected to a controlled load and the loading curve is displayed on the screen in real time. Stages are available for all Bruker micro-CT systems. They can be installed easily in place of the standard sample holder, and are controlled using dedicated software, compatible with the main scanner control programme. Micro-CT shows clearly how compression affects Noyant limestone. 9.5 mm diameter sample, scanned using the Bruker SkyScan 1275 with 12.1 µm pixel size. Continuous mode – Compression or tension up to a maximum allowable load or until the maximum displacement. Predefined mode – Up to a specified load or displacement. The loading curve is displayed on screen in real time. All load/displacement and stress/strain curves can be displayed and saved. The object can also be held under a specific single or multiple loading during imaging. If required, the load cell can be changed to a different range. 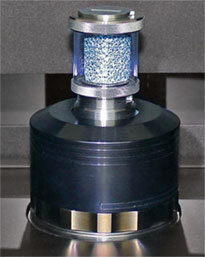 However, it is important to remember that the accuracy of the measurement is around 1% of the load cell’s full scale. The load cell’s range should be high enough for the load required, but an “oversized” load cell will negatively affect the system’s sensitivity. It’s also important to note that the load cell is installed and calibrated in the factory and cannot be replaced in the lab. 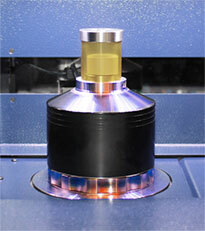 In addition to the models below, special stages are also available for micro-positioning, cooling and heating. Compatible with Bruker SkyScan 1272, 1275 and 2211. The force required depends on sample dimensions, so this is an important factor to consider when choosing a materials testing stage. The accuracy is also related to the maximum force of the load cell (typically 1 %). The recommendations for selecting scan parameters are very similar to when running a regular scan. Sample stability is key; this may involve allowing time for sample relaxation before starting the scan at a certain load point. With Bruker micro-CT material testing stages, samples can be loaded in manual mode or automatically, with a predefined load or displacement. ‘Scheduled scanning’ mode enables further automation by scanning at different loading points.